Browse: Home / How low will the euro go? What is Zen trading? It is trading done the simple way and that means looking for the right trend and finding the right entry spot. Here we have one, the decline of the euro. While the fundamental reason for this steep decline is the current monetary policy of the ECB called quantitative easing, psychological reasons are also important, as always. Today the ECB is celebrating its new skyscraper in Frankfurt and the city is already full of smoke from anti-austerity protesters clashing with the police. These protest have directly to do with the unintelligent way Europe tries to solve the problem of one of its members, namely Greece. The new government of Greece has realized that austerity is not going to help them and is stirring up the continent since some weeks, implicitly threatening to not pay back their debt and dumping the euro. They hold the “grexit”, the exit of Greece from the euro zone, in their cards. Europe’s politicians thought this was their trump. So far, they don’t seem to understand who has the stronger position. But the market does and the euro is falling since weeks. Shortly after writing the above the FED decided to suggest unexpectedly a delay for the upcoming interest rate hikes and the euro shot up. 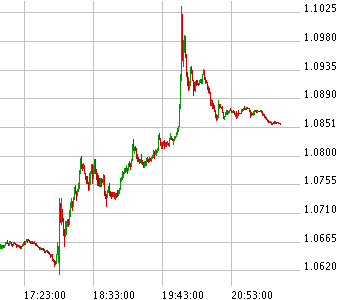 Within three minutes of the final panic it went up 180 pips. But the next day the reaction proved to be short-lived. The US is still on track to switch to rate hikes, while Europe wants to mitigate its problems with the money printing press. The markets seems to assume that they just started the money flood. Will the euro finally crack? There is real potential for a breaking euro zone. Europe has this north-south gradient of productivity and a debt going out of control for some states. As usual, politicians are not going to admit or even indicate that anything could be wrong with Europe or their beloved euro. But the euro is essentially an experiment and nothing more.